SKIPPACK, PA–(Marketwire – Oct 17, 2011) – North Bay Resources Inc. (OTCBB: NBRI) ("North Bay" or the "Company") is pleased to announce that it has signed a Memorandum of Understanding ("MOU") with Devlin's Bench Mining Ltd and P. Wright Contracting Ltd ("PWC") to enter into a joint-venture on North Bay's Fraser River Platinum Project in British Columbia. 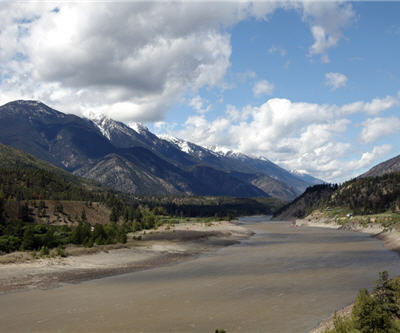 The Fraser River Platinum Property is located near Lytton in south-central British Columbia, Canada, and covers approximately 4.5 kilometers of placer claims along the Fraser River. The property includes the Van Winkle Bar, from which BC MINFLE 092ISW078 and BC Open File 1986-7 have documented historical assays of 5681 grams (182.67 ounces) per tonne platinum from black sand concentrate. On February 19, 2009, the Company announced that gold had been discovered during the first phase of test excavations 400 metres northwest of the Van Winkle Bar along an old river channel situated 75 metres higher than the existing Fraser River channel. Prior to this there were no substantive indications of gold mineralization in the Fraser River deposit. Initial reports from the site indicated that the first two test pits revealed visible gold in the black sands within two feet of the surface. The general matrix of the bench placer is described as having fine gold and platinum disbursed throughout the deposit, but at low concentrations. However, pay streaks within the general deposit are distributed in bands throughout the orebody, and are much more concentrated, especially closer to the original erosion channel. The orebody has been termed a "low velocity deposit," and a textbook example for carrying pay streaks at several depths and not just near the erosion channel. Further exploration work conducted by North Bay in 2009 confirmed the initial findings and resulted in average assays of 520 grams (16.72 ounces) per tonne gold, 5.38 grams per tonne platinum, and .04 grams per tonne palladium from black sand concentrate. The Company and PWC intend to resume development work and apply for the appropriate mining permits that will allow for production to begin as soon as the permits are approved. North Bay CEO Perry Leopold commented, "We are very excited to see work resuming at the Fraser River Project, and we are very pleased that Pete Wright and his team have agreed to join us in moving the project forward. Pete's wealth of experience and well-established relationships in the region makes him the ideal partner for our placer mining projects in British Columbia, and we are looking forward to working closely with him to bring the Fraser River Project into production as soon as possible." Terms of the agreement will be disclosed following the signing of a definitive contract. Devlin's Bench Mining Ltd is based in Barkerville, BC, and operates several placer gold mines throughout the Cariboo Mining District of British Columbia, including Conklin Gulch, Antler Creek, Devlin's Bench, Grouse, and Williams Creek. P. Wright Contracting Ltd is a Barkerville BC-based mining contractor, working in the mining sector for 20 years in British Columbia and the Yukon. PWC contracts for Ministry of Mines reclamation projects in the Cariboo Mining District, in addition to work for most other related government agencies. Fully insured and with a Lowbed company in house, PWC is 100% owned by Pete Wright and is a sister company to Devlin's Bench Mining Ltd., also 100% owned by Wright..
North Bay Resources Inc. (OTCBB: NBRI) is a fully-reporting junior mining company with over 150 mineral and placer claims encompassing approximately 60,000 acres throughout British Columbia, Canada. In the US, the Company owns the Ruby Gold Mine in Sierra County, California, and is presently planning to acquire additional operating mines in the western US. The Company's mission is to build a portfolio of viable mining prospects throughout the world and developing them through subsidiaries and JV partners to their full economic potential. North Bay's business plan is based on the Generative Business Model, which is designed to leverage its properties into near-term revenue streams even during the earliest stages of exploration and development. This provides shareholders with multiple opportunities to profit from discoveries while preserving capital and minimizing the risk involved in exploration and development.